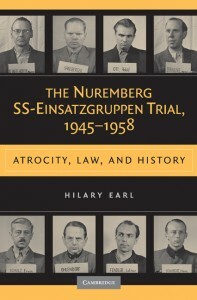 Marshall Poe’s latest podcast on New Books in History features historian Hilary Earl and The Nuremberg SS-Einsatzgruppen Trial, 1945-1958: Atrocity, Law, and History. In the first historical examination of the arrest, prosecution, and punishment of the leaders of the SS-Einsatzgruppen, Hilary Earl takes on one of the most important and insufficiently studied trials of the Holocaust. Posing hard-hitting questions on the nature of mass murder, the book showcases the first Nazi war criminals to publicly lay claim to their crimes.Based on extensive archival research – some of which is only recently declassified – Earl’s unique interdisciplinary approach synthesizes a range of historical, social, scientific, and legal resources to grant new insight into the perpetrators’ individual motivations. Hitler caused the Holocaust, that much we know (No Hitler, no Holocaust). But did he directly order it and, if so, how and when? This is one of the many interesting questions posed by Hilary Earl in her outstanding new book The Nuremberg SS-Einsatzgruppen Trial, 1945-1958: Atrocity, Law, and History (Cambridge UP, 2009). The book is about the trial of the leaders of the Einsatzgruppen, the mobile killing units that, in 1941 and 1942, spearheaded the Nazi effort to eradicate the Jewish people. The Einsatzgruppen murdered something on the order of a million people using almost nothing but firearms. In 1947, their commanders were brought to justice in what might be called the “other” (forgotten) Nuremberg Trials. The trial left an enormous body of reasonably fresh-after-the-fact testimony for historians to work with in trying to understand this episode in the Holocaust. Hilary does a masterful job of mining this material. In the first historical examination of the arrest, prosecution, and punishment of the leaders of the SS-Einsatzgruppen, Hilary Earl takes on one of the most important and insufficiently studied trials of the Holocaust. Posing hard-hitting questions on the nature of mass murder, the book showcases the first Nazi war criminals to publicly lay claim to their crimes.Based on extensive archival research – some of which is only recently declassified – Earl’s unique interdisciplinary approach synthesizes a range of historical, social, scientific, and legal resources to grant new insight into the individual motivations of those who carried out the Final Solution.